Photograph By Dr. Richard E. Lee, Jr. 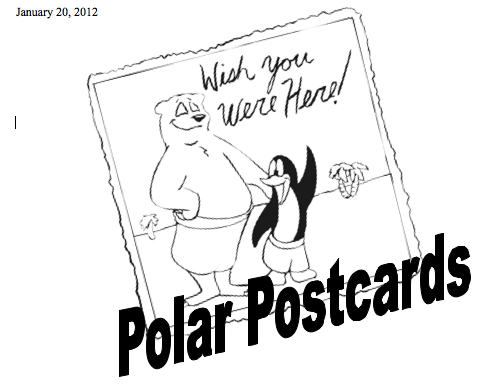 Welcome to the Polar Postcard Challenge! As you know the Crestwood Antarctic Connection is in full swing! Miss Harr is hard at work with her research team in Antarctica and we are hard at work learning about this cold continent here at Crestwood Primary School. We would like to invite our Crestwood Primary students to take part in a weekly blog challenge! Every Tuesday and Friday while Miss Harr is gone, she will post a blog challenge here. The challenge will ask the students a question that will get them thinking about life in Antarctica! For each question, some lucky winners will be chosen to win a polar postcard from Dr. Lee! The keystone species in Antarctica provides food for fish, penguins, and seals. Who am I? Dr. Lee's research team is nicknamed "The Buggers." Why do you think we earned this great nickname? Here we are! "The Buggers" from the underbelly of the world! We are called "The Buggers" because we are the ONLY group of scientists researching an insect. And you guessed it- we are learning more about the tiny wingless fly called Belgica antarctica. But, there are other insects that live down here too. Most of them live on the animals and get their food from the animals, like seal lice. We use a special type of boat to help us get around the icey waters so that we can get to islands and collect Belgica antarctica. Do you know what type of boat we use? How long is the life cycle of Belgica antarctica?